Sändra Alexander holds a Master’s Degree in Spiritual Counselling and provides services worldwide via e-mail and phone and lectures for group and keynote presentations. Sändra combines spiritual guidance and freelance writing services to encourage personal and global transformation. Sändra is an award winning author of several spirit related titles. Listen to this interview with Sandra Alexander - Spiritual Approach to Autism and Joy Truscott as they share ideas about working with Energy and Elevate. ﻿One of the Gifts of Sändra's work is her commitment to helping others to experience the sheer delight of having their Inner Wisdom and Voice brought to print. Through her business - Strength of Spirit Writing and Consulting Services the book that is within you can find its way into the Heart and homes of others. Her service provides professional and spiritual guidance to all those who are ready to share their stories and their gifts with the world through self-publishing. The program supports the process through weekly spiritual consulting as Sandra believes that this is an important part of this process, and in her words - "together we find the courage to take on the responsibility of inspiring and healing others. As we do, we reach both personal and global transformation". This commitment is evident in her own work and writing. 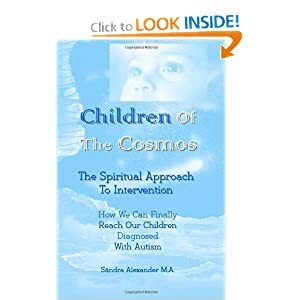 Sändra is an Award Winning Author and her latest book - Children of the Cosmos has sparked a project that is revolutionary in its approach to Autism. This book offers a step-by-step guide to apply the Spiritual Approach to Intervention (SAI). "When used in conjunction with conventional therapies, SAI can provide the success we have been seeking in connecting with children showing signs of Autism and allow us to evolve as a species in the process". As a result of this book Sändra has taken the lead as Project Manager as she has felt Guided to create an intervention project. Learn more about Autism: Spiritual Approach to Intervention Project. This book offers a step-by-step guide to apply the Spiritual Approach to Intervention (SAI). "When used in conjunction with conventional therapies, SAI can provide the success we have been seeking in connecting with children showing signs of Autism and allow us to evolve as a species in the process". The result of this magnificent work has spurred Sändra to take on the role of Project Manager to facilitate integration of this approach in working with children with Autism. "No child is fundamentally disordered. Every child is born completely perfect and equipped with all the gifts that he needs to fulfill his purpose on earth”. At this writing, according to the Center for Disease Control, 1 in 89 children in the have been diagnosed with varying degrees of Autism and Asperger’s Syndrome. Over 60 % of those diagnosed are males. The incidence of Autism diagnoses have risen more than 23% in the past 5 years in the U.S."